As the “doctor” began his examination, I felt a little embarrassed. I didn’t want to admit my total lack of discipline. “How often do you back up?” Dave Greenbaum asked. The Lawrence computer consultant, who operates on Macs and PCs as DoctorDave, was in my basement, making a “mouse call,” working to rid my computer of an ailment that kept it from booting up. His backup question stunned me. “How often are you supposed to?” I asked, stalling. The Doctor smiled, knowing that – like the majority of his residential customers – I never had backed up anything on my home computer. But if you don’t back up, you’re in danger of losing some of the most important data you own. Thanks to the digital age, much of our precious memories of life are no longer in photo albums or scrapbooks. I, for one, have thousands of photos of my family on my computer. On the street: Do you back up the information on your computer? Memories of birthdays, sporting events, vacations, proms and graduations are floating around somewhere on the hard drive of that big gray Mac computer – along with tax returns, home videos, mp3s and an assortment of homework papers and other projects from years past. With a big hard drive, all the data seems safe. But anything can happen from a lightning strike, a water accident, a fire, a tornado or even a robbery. So to keep such irreplaceable data secure, it’s a good idea to have some sort of a home backup strategy – just like businesses do, Greenbaum told me. “There are two kinds of computers,” he said. “There are those that have failed and those that are going to fail. There is no computer that will work forever. Costs for sending a computer to a data-recovery service start about $500 and can run up to as much as $20,000, he said. ¢ Make a backup plan that includes how you’ll store the data and how often you’ll schedule your backups. ¢ Store your backups off site. ¢ Periodically test your backups to be sure you know how to restore the data. There’s no need to back up everything – mainly just the new documents, photos or music you’ve added to your hard drive, Greenbaum said. If you add a significant amount each day, you might want to back up every night. He recommended that I take the data on my hard drive and back it up to an external hard drive using a shareware program called “Super Duper” that would automatically do the job for me. But there’s a problem in relying only on the external hard drive in your basement, he said. What if the dishwasher upstairs floods, water seeps through the floor and drowns not only the computer, but your backup hard drive sitting next to it? “At that point, you would just kiss everything goodbye,” he said. To be doubly safe, he told me I should also burn data onto CDs or DVDs. Another option is to do backups online. Novastor is a service for Windows users. Macintosh users can back up to a “.Mac” account or go through a service called Back Jack. The cost is about $20 to $30 a month. If you’re going to get an external hard drive, the minimum storage you’ll need is the size of your computer hard drive, Greenbaum said. ¢ Back up all sensitive data, financial records, client/customer contact lists at least once a week at a minimum. ¢ CD-ROMs usually are the most cost-effective backup media. Hard drive backups onto a fileserver are also cost-effective but not quite as safe because hard drives are fallible. ¢ Do weekly off-site backups to ensure the data is in a safe place if anything happens at the main location. ¢ An automated backup system is preferable, but you should verify from time to time that the backups are working. I was able to hunt around and find a 160-gigabyte hard drive at a store here in Lawrence for just under $100. That enables me to make a clone – an exact duplicate of my hard drive on the external drive. Another option he recommended for me was to back up my photos, videos or other documents on CDs or DVDs and store them outside the home. Greenbaum said if you were planning to save something important for a very long time, you might consider archival-type CDs, which are supposed to last about 100 years. 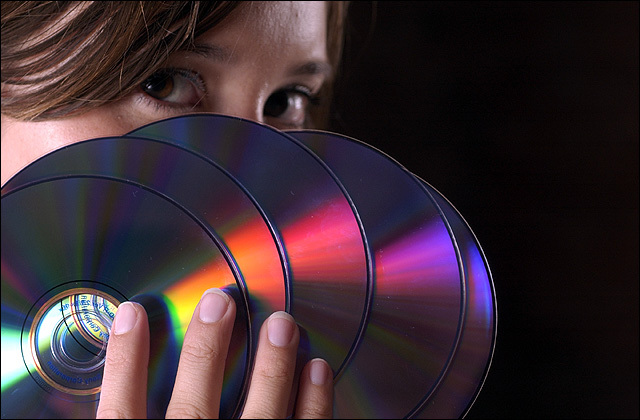 Inexpensive CDs that you can buy in a spindle will last five to 10 years, he said. Some computer users who don’t have a lot of data to store might consider thumb-sized USB flash drives, he said. Greenbaum also told me that backing up might not be so hard to do in the future. Microsoft is coming out with a new backup tool included in its new Windows Vista operating system that will offer you more choices in storing backed-up data than the basic backup utility that comes with Windows XP. And Macintosh is joining the backup party – its newest operating system due out next spring, OS X Leopard, will have a program called Time Machine that lets you pick and choose what you want to back up and when. A few days after Greenbaum set up my automated system, my daughter, Katy, and a friend, Erin Morgan, were standing in my kitchen, getting ready to head out to meet some friends. They were talking about some old family photos on our refrigerator, including one of Katy about age 7 in her Dorothy costume with ruby slippers. And I thought about one of the warnings Greenbaum had passed along earlier: There are no negatives for digital photos. “Hey Katy, do you ever back up your computer?” I asked. I reminded her that she recently got a digital camera and had been snapping lots of photos. “I haven’t ever downloaded my photos on my computer yet,” Katy said, laughing as she headed out the door. I shrugged as they left and looked at the clock. It was 10:30 p.m. I knew my own automatic backups were working. Going upstairs, I wished there was an automated system to do another nightly chore I’m not very disciplined about: flossing.